The new "Jurassic Wold: Fallen Kingdom" is now available on Blu-ray, DVD and Digital. some lucky Thisfunktional readers will be able to win the movie to add to their collection. To enter you must be subscribed to my YouTube channel: Thisfunktional and follow instagram.com/Thisfunktional and email me your full name and mailing address with the subject line #ThisfunktionalContest #JurassicWorldFallenKingdomDVD to Thisfunktional@Gmail.com. Disclaimer: Winners will be chosen. Contest runs to September. 25, 2018 11:59 p.m. PST. No purchase necessary. Prize provided by MPRM Communications. Only open to the U.S., no PO Boxes or international addresses. Only one entry per household. Entries on behalf of another person will not be accepted and joint submissions are not allowed. We will not accept entries of contestants who have claimed a prize in the last 6 months. Celebrate the newest installment of the action-packed Jurassic franchise when "Jurassic World: Fallen Kingdom" arrives on Digital and via the digital movie app MOVIES ANYWHERE on September 4, as well as on 4K Ultra HD, 3D Blu-rayTM, Blu-rayTM, DVD and On Demand on September 18, featuring more than an hour of bonus content – including Chris Pratt’s behind-the-scenes “Jurassic Journals” captured on-set. The global blockbuster from Amblin Entertainment and Universal Pictures held the No. 1 spot for four straight weeks at the international box office, and topped the North American box office for two weeks is a worldwide hit, earning over $1 billion in global ticket sales. With the release of "Jurassic World: Fallen Kingdom," the Jurassic franchise is now one of the top grossing franchises of all-time grossing over $4.7 billion at the box office. "Jurassic World: Fallen Kingdom" continues to deliver adventure and thrills with the homecoming of beloved characters along with the introduction of new creatures that are more awe-inspiring and terrifying than ever before. 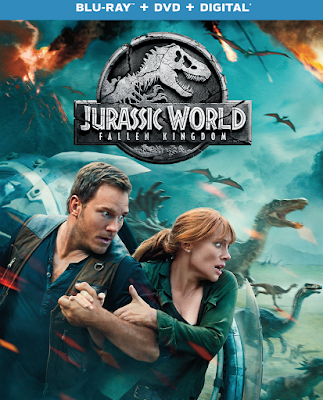 Building on the wonder and adventure that has mesmerized audiences worldwide, "Jurassic World: Fallen Kingdom" continues one of the most thrilling series in movie history with an adventure 65 million years in the making, captivating audiences of all ages with a stunning new chapter filled and more dinosaurs than any other Jurassic film. Stars Chris Pratt (Jurassic World, Guardians of the Galaxy franchise) and Bryce Dallas Howard (Jurassic World, Pete’s Dragon) return as Owen Grady and Claire Dearing with original cast members Jeff Goldblum (Jurassic Park, Thor: Ragnarok) and BD Wong (Jurassic World, “Law and Order: SVU”) reprising their iconic roles. Bring home the non-stop adventure, learn the incredible twist, and find out what happens when the park is gone. In "Jurassic World: Fallen Kingdom" directed by J.A. Bayona (The Impossible, The Orphanage) and executive-produced by Jurassic titans Steven Spielberg and Colin Trevorrow, Owen (Pratt) and Claire (Howard) return to Isla Nublar three years after the destruction of the Jurassic World theme park to rescue any remaining dinosaurs on the island from a catastrophic volcano that threatens to leave dinosaurs extinct once again. Owen is driven to save his lead raptor, Blue, while Claire makes it her mission to preserve the creatures that she has grown to deeply respect. When the lava begins to rain down, they soon discover terrifying new breeds of ferocious dinosaurs along with a conspiracy that could threaten the entire world. Joined by co-stars James Cromwell (Babe, The Green Mile) as wealthy entrepreneur Benjamin Lockwood, Dr. John Hammond’s partner in creating Jurassic Park, as well as Justice Smith (The Get Down) and Daniella Pineda (The Detour) as Franklin Webb and Zia Rodriguez, members of Claire’s Dinosaur Protection Group; this brilliant cast brings an extraordinary story to life as chaos erupts when Owen, Claire, and their team discover a most deadly endgame that could bring the planet back to prehistoric times. Complete your Jurassic library when the all-new five-Movie Collection is available on 4K Ultra HD, Blu-rayTM and DVD on September 18. Now fans can experience the glory of all five movies in one complete must-own set including, "Jurassic Park," "The Lost World: Jurassic Park," "Jurassic Park III," "Jurassic World" and the all-new movie "Jurassic World: Fallen Kingdom." The film will be available on 4K Ultra HD in a combo pack which includes 4K Ultra HD Blu-rayTM, Blu-rayTM and Digital. The 4K Ultra HD disc will include the same bonus features as the Blu-rayTM version, all in stunning 4K resolution. 4K Ultra HD is the ultimate movie watching experience. 4K Ultra HD features the combination of 4K resolution for four times sharper picture than HD, the color brilliance of High Dynamic Range (HDR) with immersive audio delivering a multidimensional sound experience. MOVIES ANYWHERE is the digital app that simplifies and enhances the digital movie collection and viewing experience by allowing consumers to access their favorite digital movies in one place when purchased or redeemed through participating digital retailers. Consumers can also redeem digital copy codes found in eligible Blu-rayTM and DVD disc packages from participating studios and stream or download them through Movies Anywhere. MOVIES ANYWHERE is only available in the United States. For more information, visit moviesanywhere.com.